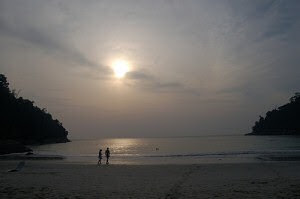 When Sports Illustrated opts to make their next swimsuit photoshoot in Pangkor Laut Malaysia, you can imagine the mindblowing exotic sceneries you can expect on your next holiday to the Pangkor Laut Resort Malaysia. What I love the most about the Pangkor Laut Island Resort is the above pavilion where the Pangkor Laut's yoga sessions are held every morning and afternoon. 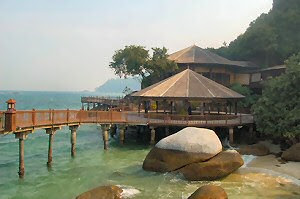 And behing the yoga pavilion is the Pangkor Laut Resort restaurant with excellent food without being bothered by the price when you opt for the 3 day- 2 night all in one holiday package. 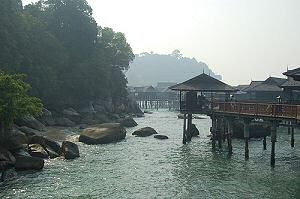 On an hilarious note: I was standing in line to book my holiday at my travel agent when I heard the people before me trying to book 14 days at the Pangkor Laut resort and the only answer the - in my mind not too smart - travel agent could give was: you can only opt for the 3 day - 2 night all in one Pangkor Laut Malaysia package... Really, if people want to pay full price to indulge for 14 days in Malaysia's paradise, why do you want to force them a package?